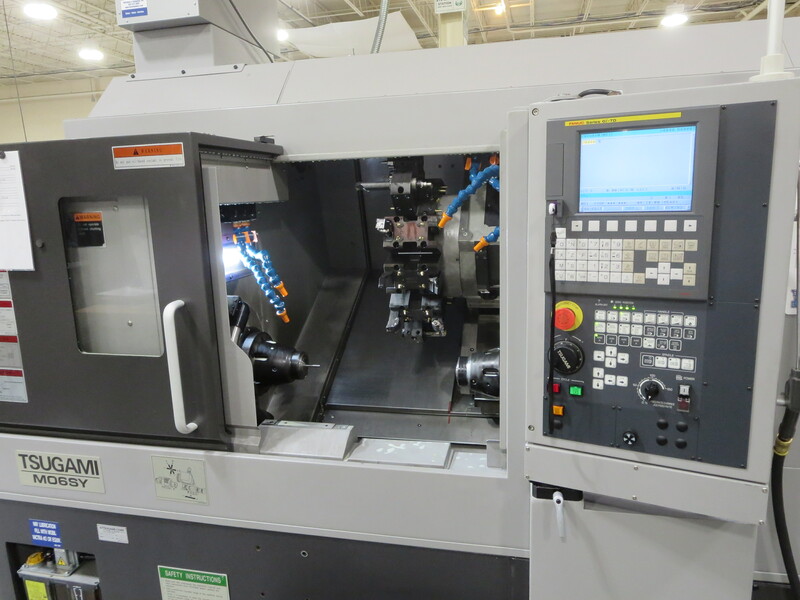 L&R is pleased to announce the addition of a Tsugami MO6SY to our multi-axis CNC Mill/Turn department. The Tsugami M06SY Turning Center with Y-axis allows you to perform highly complex machining, such as turning, drilling, boring, cross-drilling and CNC milling. The main and subspindle are equipped with integral built-in spindle motors which minimize vibration and provide superior accel/decel for heavy duty cutting and fine finishing. The Y-axis enables off center CNC milling of complex parts, and incorporating the subspindle eliminates the need for secondary operations. Ideal for a wide range of applications, the M06SY is built for high accuracy, high production machining. The Y-axis enables turret tool positioning above or below center. The robust 12-position turret mounted to the Y-axis allows users to mount driven tooling at any turret position for use on the main or subspindle. This tool zone flexibility coupled with the C-axis provides the capability and flexibility to machine virtually any feature and drop your part complete in one clamping. It has the Fanuc Oi-TD Control and is outfitted with a LNS Super Hydro HS bar feeder. In addition to our Telesis 20 watt Laser Marking System utilized for permanent part marking we have added 2) Richter OPM 8/5 Dot Peen Marking Systems.